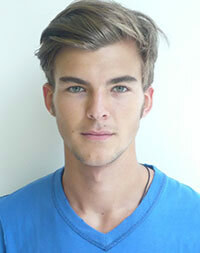 Patrick Kafka was born in Vienna, Austria, in 1989, is an Austrian male model. He began his modeling career at the age of fifteen, signed to Q Management New York City and Stella Models. He made his modeling debut in campaign for Abercrombie & Fitch, photographed by Bruce Weber in 2009. He made his catwalk debut at Milan Fashion Week in 2009. He won the Super Model Contest in Austria (2008). He won the Vienna Fashion Award for Best Model in 2011. Become the face of Trussardi in 2009. Become the face of Polo Ralph Lauren in 2010. Long time highly ranked on models.com list of the Top 50 male models. GQ Australia, August Man Malaysia, The Room, Open Lab, D'Scene, Kult Germany, Adon, Rondo Cover, The Greatest, Intersection, Esquire Spain, GQ Spain, GQ China, DSECTION, Elle Men Mexico, Out Magazine, Fiasco, Hercules, Wiener Magazine, GQ Style Italy, Essential Homme, Diva Cover, Slurp, Robb Report, Instinct, August Man Malaysia, Esquire China, CLIENT Cover, L'Officiel Hommes Italia, GQ Japan, S Moda for El Pais, Vogue Hommes Japan. Massimo Dutti, Eduard Dressler, Antony Morato, Diesel Underwear and Beachwear Online, Balmain, DKNY, Marina Yachting, Lincs by David Chu, Daniele Alessandrini. Walked runway for Ralph Lauren, Giorgio Armani, Emporio Armani, Dolce & Gabbana, Andrea Incontri, Brioni, Canali, Enrico Coveri, Moncler, Ermenegildo Zegna, Dsquared2. Represented by agencies Nous Model Management Los Angeles, Select Model Management London, Kult Model Agency Hamburg, New Madison Paris. I own many Shirts from Ralph Lauren, I like their style really much! My style is most of the time really casual and sporty. I think after the few years I'm in this business I learned how to get into every character really quick.